The warm summer months are now a distant memory. Temperatures have dropped, the clouds are grey and de-icing the car is now a frequent early morning chore. But YES, we still run. NO, we are not mad but careful preparation is required if it’s going to be a joyful jaunt. After many years of running (and getting it wrong), this is the best advice I have to offer to all runners. Choose thin, moisture wicking layers. Stay after from cotton because it holds onto moisture and will keep you wet. Then, an outer Gore-tex layer would be my choice, windproof and breathable. This will let out heat and moisture to prevent overheating and chilling. Wear moisture wicking gloves or mittens on really cold days as your fingers with share their body heat. Wear thicker socks on your feet but make sure you have enough space in your trainers to allow for this. You don’t want to end up with a painful, discoloured nail, even in winter. And finally, wear a thin beanie that effectively covers your ears and wicks away sweat. If you find yourself overheating, you can easily roll it up and stuff it in your pocket. Hand bands are a great alternative if your hot headed! Or even a buff. Avoid running in the dark if you can. If you must run at night, wear reflective gear and light-coloured clothing. Running head touches are a must if you’re going off the beaten track. Dress in bright colours if you’re running during the daytime. Drivers may not expect to see runners out on the road (especially in the early hours or very late at night) during the winter, so make you can be seen. Sunburn is still possible in the winter as the sun’s radiation isn’t any less due to lower temperatures. So, slap on a high SPF before heading out and protect your lips with lip balm. This prevents them getting chapped in the cold and wind. Despite the cold, you will still lose fluids through sweat. Make sure you drink water or a sports drink before, during, and after your run. Hand held water bottles are great but if you’re running a longer distance it’s worth investing in a water hydration backpack. Dehydration of just 2% of your body weight will impair your performance. Don’t be caught out. You’re at a greater risk of pulling a muscle when running in the cold, so warm up slowly and run easy on very cold days. Save your tough workouts for milder days or run them indoors on a treadmill. If the cold weather stops you from stepping foot outside the door, arrange to meet a friend. 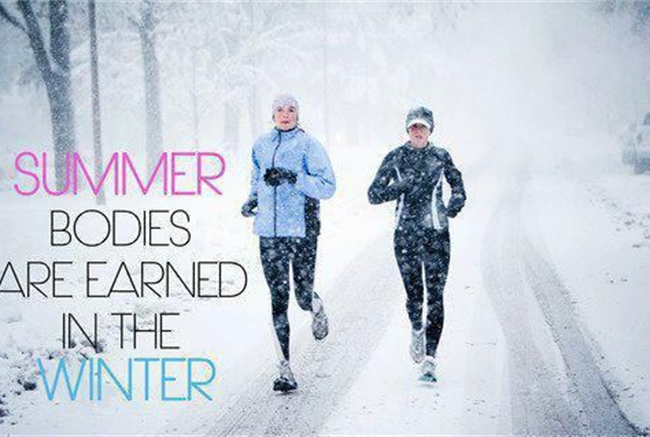 This will help you commit to a run, take your mind off the cold and with any luck enjoy it! Knowing and Listening to the Difference Between What the Body and Mind Tells You.